Hey, so acouple of months back I played some GC games with absolutely no problems at all, my controls binded fine and just today as I tried to play it again, everything went to hell. I use the 3-in-1 Magic Joy Box controller adapter with an original Gamecube controller but I am finding it impossible to bind the main joystick and a c stick. 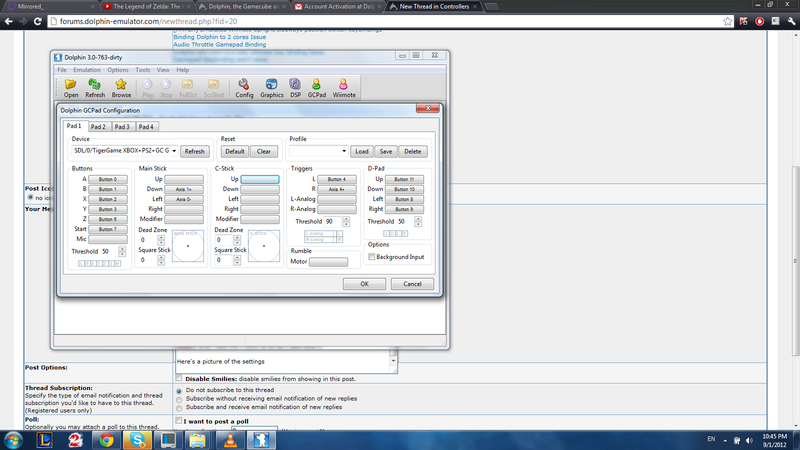 The controller works perfectly fine on my Wii however its impossible to bind on the emulator. The buttons bind and work just fine, but its not reading Up or Right on the main stick. Left and Down work fine but it wont read Up or Right at all (Picture of the settings below). It also doesnt even read the c-stick at all so I cant bind it. I had that issue and deleted the joy what ever ini file. Ran dolphin and re mapped all buttons and what not. Fixed it up for me. Cant hurt to back up first. (09-02-2012, 01:11 PM)ulao Wrote: I had that issue and deleted the joy what ever ini file. Ran dolphin and re mapped all buttons and what not. Fixed it up for me. Cant hurt to back up first. User/Config/Profiles in dolphin? There was no profiles section and I tried deleting and reinstalling dolphin to try to get the controller to work Still no luck. Oh from the screen shot it looks like you are using sdl. Go direct X... Do you have the latest version? I do use Direct X and it is the latest version : / Under devices on the controller config menu there is Dinput and SDL, I tried both and when I made the screenshot I was using the SDL option. Dolphin and the controller work fine on my other computer, just not my main. I dont know why it would break when it worked perfectly fine all summer Ive also tried multiple versions of dolphin with no luck. Your image showed sdl, yeah dont use that. Well like I said I saw that before. Other things to try. 1) Try a new usb port? 2) make sure its not a calibration big. Try to re calibrate it.